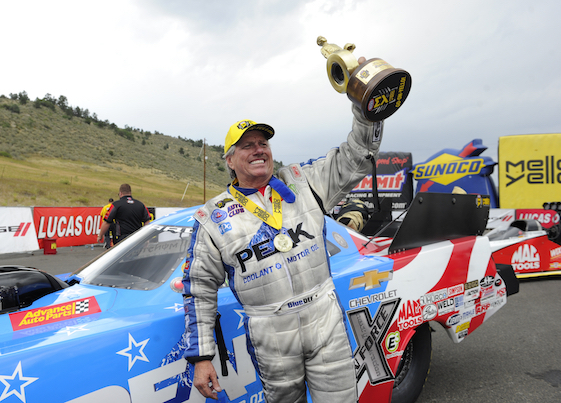 Funny Car icon John Force returned to the top of the mountain Sunday, racing to his 149th career victory and first in over a year to cap the 39th annual Dodge Mile-High NHRA Nationals in Morrison, Colo.
Leah Pritchett (Top Fuel), Greg Anderson (Pro Stock) and Hector Arana Jr. (Pro Stock Motorcycle) also emerged as winners in their respective categories at the 14th of 24 events on the 2018 NHRA Mello Yello Drag Racing Series schedule. The event contested at Bandimere Speedway in the thin air outside Denver was the first of the NHRA’s annual summertime three-race Western Swing. A 16-time world champion and winningest driver in NHRA history, Force defeated two-time Funny Car champion Matt Hagan, long-time nemesis and two-time champ Cruz Pedregon, daughter and current point-leader Courtney Force and 2016 world champ Ron Capps to hoist his latest Wally trophy. At the end of his day, “Brute” Force thanked two people for inspiring him to victory. One was life-long friend John Bandimere Jr., the owner of Bandimere Speedway. The other was Kirstie Ennis, a U.S. Marine who lost a leg during combat in Afghanistan and was at the track representing Building Homes for Heroes and Advance Auto Parts. “I found myself with all the crashes and everything that happened probably at the lowest point in my career. It’s been worse than when I crashed in 2007,” said Force, recounting the start of his 2018 season in his Chevrolet Camaro SS. “I’ve been fighting to get back. I never let on to anyone but it showed that I just looked like a mess. I’m fighting to get back. I had four crashes and after my last one I had John Bandimere call me and say, ‘We have to talk.’ I said, ‘I know you love God and I know where you want to go.’ He told me to listen to him and he set me straight. Force said he would give his Wally to Bandimere, and would order another for Ennis, who was introduced to him this weekend by daughter Courtney. The final round against Capps, of Don Schumacher Racing, saw Force leave the starting line with an 0.037-second reaction time en route to covering the 1,000-foot distance in 4.075-seconds at 315.42 mph to Capps’ run of 4.067-seconds at 308.71 mph. Force improved his record against Capps, driver of the DSR Dodge Charger R/T, to 58-38 and 11-8 in final rounds. The victory also gave Force 1,303 round-wins and marked him as the most prolific winner in Denver history with eight titles. Victory also positioned Force to sweep the famed Western Swing for the second time. He is the only Funny Car driver to win the three-races-in-three-weeks gauntlet, a feat he accomplished in 1996. The series will continue with the 31st annual Toyota NHRA Sonoma Nationals at Sonoma (Calif.) Raceway July 27-29 and conclude with the 31st annual CatSpot NHRA Northwest Nationals at Kent, Wash., outside Seattle, Aug. 3-5. “I had to beat a lot of great racers today _ Hagan, Cruz, Capps _ I love them all. My fire was in me,” said Force, a 69-year-old resident of Yorba Linda, Calif. “I’m fighting and I got tired of hearing me snivel to myself. My wife doesn’t even want to talk to me. I’m working through rehab to get out here to win races. I don’t know why I won this race but I have a lot more fight in my belly. Pritchett dominated Top Fuel during the course of the weekend en route to her second win of the season and the seventh in her career. Piloting her Dodge Mopar 1320 dragster she was No. 1 qualifier for the second consecutive event and 10th time in her career. Matched against Doug Kalitta in the final, Pritchett covered the 1,000-foot distance in 3.831-seconds at 316.45 mph to Kalitta’s losing numbers of 3.852-seconds at 319.82 mph. Pritchett defeated Terry Totten, Scott Palmer and Clay Millican to reach the final. In Pro Stock, Anderson posted his first win of the year, third at the facility and the 91st in his career when he defeated Ken Black Racing teammate Jason Line in the final. Anderson covered the traditional quarter-mile in 6.943-seconds at 196.53 mph in his Summit Racing Equipment Chevy Camaro SS to overcome Line’s run of 6.947-seconds at 196.19 mph. A four-time world champion, Anderson also retook the point lead in the “Factory Hot Rod” category. “I’d like to think that this is the start to a great rest of the season,” said Anderson, who is celebrating 20 years as an NHRA Pro Stock driver. It also was his first trip to the winner’s circle since the fall race in Las Vegas last season. “We’ve had a heck of a battle this year, and our Summit Racing Chevrolet Camaros have been running great _ we just haven’t been able to close the deal on Sunday,” said Anderson, a 57-year-old resident of Charlotte, N.C. “We’ve garnered a lot of green hats for being the No. 1 qualifier, but we haven’t been able to get hold of one of these yellow winner’s circle hats this year until now. Anderson defeated Joey Grose, Vincent Nobile and five-time world champ Jeg Coughlin Jr. to advance to the final. Arana Jr. defeated 2016 world champion Jerry Savoie to score his first win since Gateway Motorsports Park in Madison, Ill., outside St. Louis, in 2015. Arana Jr. earned his 12th career win when Savoie red-lit at the starting line. Arana Jr. went on to cover the quarter-mile 7.170-seconds at 185.89 mph aboard his Lucas Oil EBR. This was the first final round of the year for Arana Jr., a son of 2009 world champion Hector Arana. Hector Jr. advanced to the final by defeating point-leader and five-time world champion Andrew Hines aboard his Screamin’ Eagle Vance & Hines Harley-Davidson Street Rod in the semifinals. Top Fuel _ 1. Leah Pritchett; 2. Doug Kalitta; 3. Clay Millican; 4. Blake Alexander; 5. Scott Palmer; 6. Steve Torrence; 7. Jim Maroney; 8. Richie Crampton; 9. Tony Schumacher; 10. Antron Brown; 11.Greg Carrillo; 12. Terry Totten; 13. Bill Litton; 14. Brittany Force; 15. Mike Salinas; 16.Terry McMillen. Funny Car _ 1. John Force; 2. Ron Capps; 3. Robert Hight; 4. Courtney Force; 5. Tommy Johnson Jr.; 6. Cruz Pedregon; 7. Tim Wilkerson; 8. Jack Beckman; 9. J.R. Todd; 10. Jonnie Lindberg; 11. Matt Hagan; 12. Jeff Diehl; 13. Terry Haddock; 14. Bob Tasca III; 15. Shawn Langdon; 16. Todd Simpson. Pro Stock _1. Greg Anderson; 2. Jason Line; 3. Chris McGaha; 4. Jeg Coughlin Jr.; 5. Deric Kramer; 6.Vincent Nobile; 7. Alex Laughlin; 8. Tanner Gray; 9. Bo Butner; 10. Drew Skillman; 11. Matt Hartford; 12. Fernando Cuadra; 13. Erica Enders; 14. Alan Prusiensky; 15. Joey Grose; 16. Will Hatcher. Pro Stock Motorcycle _ 1. Hector Arana Jr.; 2. Jerry Savoie; 3. Andrew Hines; 4. Karen Stoffer; 5. Scotty Pollacheck; 6. LE Tonglet; 7. Steve Johnson; 8. Matt Smith; 9. Hector Arana; 10. Angie Smith; 11. Jim Underdahl; 12. Angelle Sampey; 13. Ryan Oehler; 14. Joey Gladstone; 15. Cory Reed; 16. Eddie Krawiec. Top Fuel _ Leah Pritchett, 3.831-seconds, 316.45 mph def. Doug Kalitta, 3.852-seconds, 319.82 mph. Funny Car _ John Force, Chevy Camaro, 4.075, 315.42 def. Ron Capps, Dodge Charger, 4.067, 308.71. Pro Stock _ Greg Anderson, Chevy Camaro, 6.943, 196.53 def. Jason Line, Camaro, 6.947, 196.19. Pro Stock Motorcycle _ Hector Arana Jr., Buell, 7.170, 185.89 def. Jerry Savoie, Suzuki, Foul/Red Light. Competition Eliminator _ Don Thomas, Dragster, 7.746, 134.82 def. David Kramer, Dragster, Foul/Red Light. Super Stock _ Chris Chaney, Chevy Camaro, 10.971, 120.91 def. Shaun Vincent, Pontiac Firebird, 10.658, 125.97. Stock Eliminator _ Drew Skillman, Ford Mustang, 9.379, 143.20 def. Lane Weber, Buick Skyhawk, 16.462, 79.81. Super Comp _ David Hutchens, Dragster, 9.453, 174.48 def. Bill Percival, Dragster, 9.413, 160.16. Super Gas _ Michael Miller, ’27-T Ford, 13.489, 92.68 def. Kevin Moore, ’34 Chevy Roadster, Foul/Red Light. Super Street _ Brian Percival, Dodge Dart, 11.515, 134.74 def. Michael Condon, Chevy, 11.488, 127.90. Top Dragster presented by RacingRVs.com _ Rick Milinazzo, Dragster, 7.480, 163.35 def. Josh Herman, Dragster, 7.444, 175.52. Top Sportsman presented by RacingRVs.com _ Greg Lair, Chevy Camaro, 7.028, 189.28 def. Monte Green, Ford Fusion, 7.008, 199.14. FINAL _ Pritchett, 3.831, 316.45 def. Kalitta, 3.852, 319.82. FINAL _ J. Force, 4.075, 315.42 def. Capps, 4.067, 308.71. FINAL _ Anderson, 6.943, 196.53 def. Line, 6.947, 196.19. FINAL _ Arana Jr., 7.170, 185.89 def. Savoie, Foul/Red Light. Top Fuel _1. Steve Torrence, 1,132; 2. Clay Millican, 959; 3. Leah Pritchett, 949; 4. Tony Schumacher, 930; 5. Doug Kalitta, 893; 6. Antron Brown, 750; 7. Terry McMillen, 696; 8. Brittany Force, 658; 9. Richie Crampton, 576; 10. Scott Palmer, 544. Funny Car _1. Courtney Force, 1,156; 2. Matt Hagan, 946; 3. Ron Capps, 930; 4. Robert Hight, 911; 5. Jack Beckman, 906; 6. J.R. Todd, 832; 7. Tommy Johnson Jr., 746; 8. John Force, 735; 9. Shawn Langdon, 647; 10. Bob Tasca III, 596. Pro Stock _1. Greg Anderson, 1,044; 2. Tanner Gray, 976; 3. Erica Enders, 969; 4. Vincent Nobile, 947; 5. Chris McGaha, 875; 6. Drew Skillman, 842; 7. Jeg Coughlin Jr., 838; 8. Bo Butner, 782; 9. Jason Line, 778; 10. Deric Kramer, 725. Pro Stock Motorcycle _1. Andrew Hines, 591; 2. Eddie Krawiec, 564; 3. Hector Arana Jr., 501; 4. LE Tonglet, 493; 5.Jerry Savoie, 481; 6. Scotty Pollacheck, 417; 7. Matt Smith, 411; 8. Angie Smith, 304; 9. (tie) Hector Arana, 289; Angelle Sampey, 289.